The gold spread trading market did not benefit in the same way as other risk assets and couldn't sustain its strength from earlier in the day. This morning the precious metal is at $1654, so for now the short term trend remains intact and the bulls will be looking for a test of resistance around $1670/80 whilst they'll be hoping support at $1639/25 will hold up. Thanks to a weaker US dollar, gold enjoyed a third day of gains yesterday as investors viewed the dollar denominated commodity market as a bargain. Some may see it as ironic that the asset, used recently as a hedge in the market turmoil, has risen on the back of successful debt auction in Germany and Portugal. The yellow metal ended the day up $7.6 at $1658.5 and now market watchers will see if the support turned resistance level of $1666.1 can be breached. Currently, the precious metal is up at $1663.4. The two contradicting forces in yesterday's session for crude meant that the energy source ended the day only marginally lower. On one hand, the weaker dollar pushed prices higher for black gold, but on the other, the prospect of rising supplies put off energy investors off a bout of aggressive buying. Hopefully later today the weekly inventories report will provide some direction for the liquid stuff, but as it stands, Brent crude oil trades up at $111.27. Gold dipped yesterday as the bulls seem to have lost momentum briefly. With the precious metal at $1652 this morning the recent high around $1665 remains the next hurdle of the bulls. On the downside they'll be hoping that the near term support at $1640 and $1630 will hold out. Metal prices have had a good start to the year in general, similar to equity markets, and for that to continue they will rely on a continuation of the build in risk appetite. Gold's price was boosted yesterday by a slightly weaker dollar as risk adverse investors searched for an alternative safe haven for their assets. Unfortunately, with low volumes due to a US holiday, the boost was not one worth shouting about and by the end of the session the yellow metal had only gained $4.7 to end at $1643.4. At time of writing though, it seems that the Americans feel they missed out on the small rally and are catching up as the precious metal is up at $1660.6. Grasping little direction from the equities markets, crude turned to the single currency for guidance, jumping on the back of a market rally. Not only this but, after looking at the tensions between Iran and the West, investors appear to feel that a decline in prices is a good opportunity to go long. Currently, Brent crude oil trades up at $112.15. 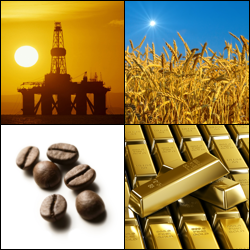 Commodities contracts for differences investors may have looked at gold's performance last week as though it was attempting to make a comeback, with news of possible further monetary stimulus in China and Europe helping spur on the bulls. But in fashion with Friday 13th, negative news from S&P about their downgrade on 9 European members' credit ratings sent investors fleeing from gold and into the latest safe haven, the US Dollar. All in all, the precious metal lost $10.4 to close at $1639.3, which at time of writing is slightly changed, with the yellow brick trading up at $1643.7. For some, S&P's downgrade on the 9 Eurozone members wasn't a shock, after many a warning from the credit rating agency. Futures account holders will still be waiting to see any follow up on the matter though as attention has been swung back to Europe. On the other side, the possibility of a strike in Nigeria could disrupt oil productions, along with the unfinished sanctions against Iranian crude exports, meaning energy traders are staying on red alert, hence the limited decline on Friday. This morning Brent is higher at $111.36 on the back of renewed tensions in Iran as they are seen to be threatening their neighbours if they replace Iran's reduced output imposed due to sanctions. The gold futures market market saw a halt to its recent strength as it initially rallied but then pulled back in line with equity markets later in the day. The comments from ECB's Draghi helped it to rally in line with the euro and for now the precious metal seems happy within the mid $1600 area as it trades at $1645 this morning. As we head into the Indian wedding season this could help support the price of gold and goes someway to show that even if it is expensive, people will buy it if they really want to for a special occasion. Brent crude oil was mixed too, almost tracking gold's footsteps as it rallied then pulled back. The price of crude remains frothy with lots of geopolitical tension loaded into the price. Nigeria and Iran are playing their part in keeping the price elevated so for now the bulls seem to remain in control. At the time of writing Brent is at $111.80. Gold continues its grind higher as the precious metal has made its way back to $1645 which is where it currently sits at the time of writing. Bullish sentiment towards the yellow brick has really built up in recent days and our futures account holders remain heavily long gold. They are no doubt hoping that this grind higher will continue to test all time highs, although this is some way off. Brent crude oil continues to be propped up by the geopolitical tensions in the Middle East with the price above $113 this morning at $113.20. Gold is creeping ever higher giving the bulls hope that we might see a test of the all time highs set back in August and September last year. At $1646 this morning upside targets are seen at 1650/60 meanwhile to the downside $1623/04 are seen as support. With the prospect of a new recession rife on investors' minds, the current trading view on the commodities markets seems to be pretty short term. This means that any rally witnessed is shortly followed by a bout of profit taking, unfortunately not helping markets gain any ground. Not only this, but outlook on the US dollar is an exciting one, with the American economy in better shape, limiting any potential gains in dollar denominated gold. So after a small rally in the morning session, gold retracted in the face of the stronger US dollar, ending the day down $5.4 at $1610.9. Currently, the precious metal sits at $1616.4. Much like gold, crude oil was hit by the concerns over another recession and the state of the Eurozone economy. The only factor limiting the decline was the tension between Iran and the West as the Middle Eastern country made public a second facility for enriching uranium, while an American citizen was sentenced to death for allegedly spying. At time of writing, there hasn't been much action and Brent is trading up 40 ticks at $112.87. The better than expected US jobs figures on Friday meant that demand as a safety net for gold was thin as investors risk appetite returned. Not only this but a strong US dollar and possibly a bit of pre-weekend profit taking caused the precious metal to finish down $4.8 bucks at $1618.0 after reaching an intraday high of $1631.1 earlier in the session. Traders have seen the yellow brick rally from as low as $1522.4 since December 29th and technical analysis suggests that this boost isn't yet over, with a short and long term bullish trend. Currently, gold is trading up on the day at $1620.1. Crude oil CFDs were given a leg up after the US labour market data was released on Friday, pointing towards a high demand for black gold in the coming months. However, the advance was capped by a strengthening greenback and slumping equity markets, along with the after-thought on the bearish inventories report released the previous day. At time of writing, the black stuff trades at $113.47.